There is a vast amount of reference material you coiuld go through, - there is a page of BIM References under resources here - but instead you could ask for a prelimary discussion in order to plan how best to take advantage of what BIM has to offer, whether you are a developer, owner, maintainer, or material supplier. 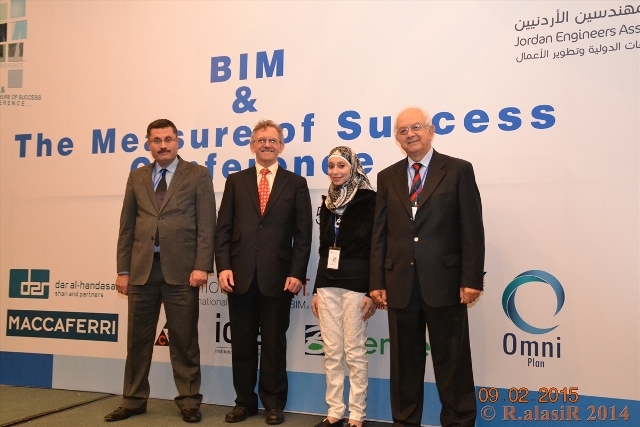 In February Barry gave two presentations and joined the panel for a discussion in Amman, Jordan because of his role as an Information Systems Panel and BIM Task Group member with the Insttution of Civil Engineers. The photo here shows Barry with the organisers, Mohammad, Hadeel and Hani. During this event he discussed the benefits with an audience of 200 engineers and architects, with ideas for them, their clients and the supply chain, He drew on examples of good practice for small and large organisations. For a prelimary discussion on the following, key questions to develop your approach to obtaining the advantages of better asset maangement please contact us. What can you and your organisation do? How can you improve the way in which you work with your clients in property and construction? What collaborative arrangements can you adopt to obtain quick wins? BIM is being adopted by the public sector with a 2016 target date, but the benefits are available for all property owners and developers and anyone in the entire supply chain. The Property and Construction industry has been slow in adopting the facility to exchange and share information electronically. The auto and aero industries have been benefitting from doing so for many years. While the industry has made some progress over the past 25 years or so, there is still much to do. The benefits for whole life asset management are enormous, estimated at anything up to 30% or even more. The technology is largely agreed to be the easy part. For full adoption the client and the whole supply chain has to engage with each other in a spirit of collaboration and trust. We engineers can help our clients to take advantage of BIM for lower risks, lower costs, safer sites, and better asset management. There are further and much greater savings during the life of the completed asset, through better knowledge of how to maintain the asset. As a single example, imagine the number of times a building or part of it is surveyed needlessly when, properly managed, the data can be captured and updated progressively for the use of subsequent facilities managers and their suppliers. What can you do to engage with BIM and achieve the benefits? A collaborative long term approach to design, construction and asset management will save you money.